Well, it's gone. 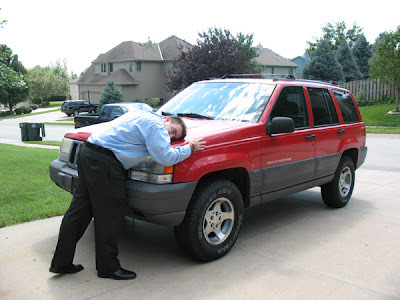 Seven good years with the Jeep. It's a sad goodbye, but my last major obstacle to leaving. Hey Justin, sorry I missed your going away shindig, but we went out a few times before that, so it's all good. Can't believe the jeep is sold... I remember going to play rehearsal in that. Memories... enjoy your last days as a corporate whore! Hey well done! Unloading a few major posessions is a great way to really feel like the trip is on the way. Enjoy it! Now that the sale is long completed: I've puked on the passenger side of that car. Remember the birthday shindig at Plum's?